This week has seen two significant prices of news relating to the new nuclear reactor being constructed at Hinkley Point in Somerset. 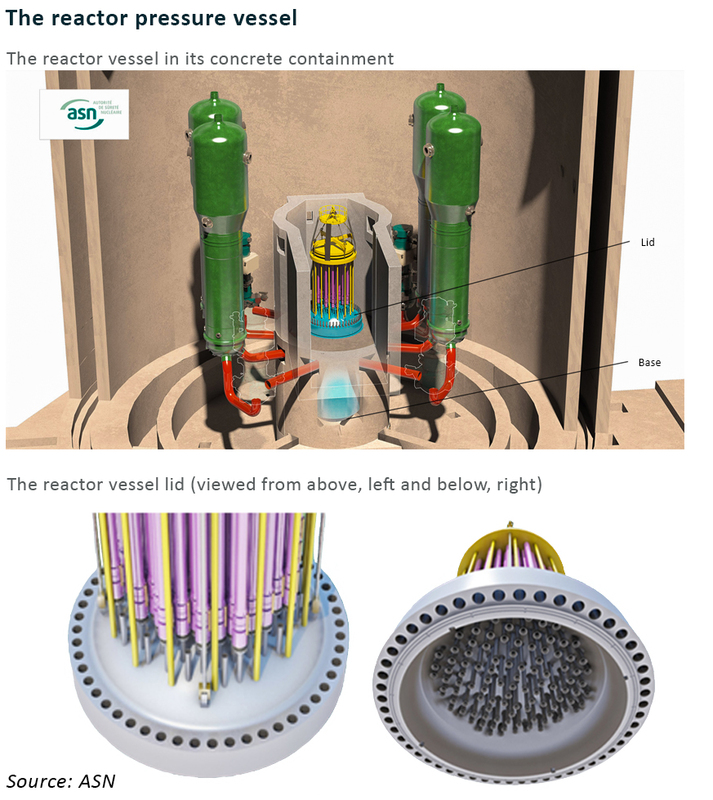 Firstly, the French nuclear regulator, the Autorité de Sûreté Nucléaire (“ASN”), has made a preliminary decision relating to the pressure vessel at Flamanville, the proto-type European Pressurised Water Reactor for the HPC build, and secondly, the UK’s National Audit Office has found significant failings in the approvals process for HPC which has locked consumers into an expensive and risky project with uncertain economic benefits. In 2014 the scandal of forging errors that had been subject to an extensive cover-up was first discovered. It was found that some of the nuclear reactor pressure vessels produced at Areva’s Le Creusot facility in France and by the Japan Casting and Forging Corporation contained excess carbonisation – a matter of concern since high carbon levels can make the steel more brittle and less able to withstand high pressure. During the winter of 2016, all of EDF’s French nuclear reactors has to be taken out of service for testing on their reactor pressure vessels and although excess carbon levels were found, the reactors were considered to be safe and returned to service. However, the new reactor at Flamanville was also found to contain excess levels of carbonisation, and given the more stringent safety requirements that have been introduced since the previous French reactors were commissioned, the Flamanville reactor did not meet current safety standards. This left ASN with a difficult decision. Forcing EDF to replace the pressure vessel would mean the plant could not enter service as planned in 2018, however, issuing a safety certificate would be difficult in the context of EU-wide standards. Following extensive testing and deliberations, ASN has decided that the bottom section of the pressure vessel is acceptable for use, albeit with additional monitoring, and the containment lid may enter service in 2018 as planned, but must be replaced no later than the end of 2024 (as the manufacturing process for a containment lid is around seven years). This is a preliminary decision, with final confirmation not expected until the autumn. 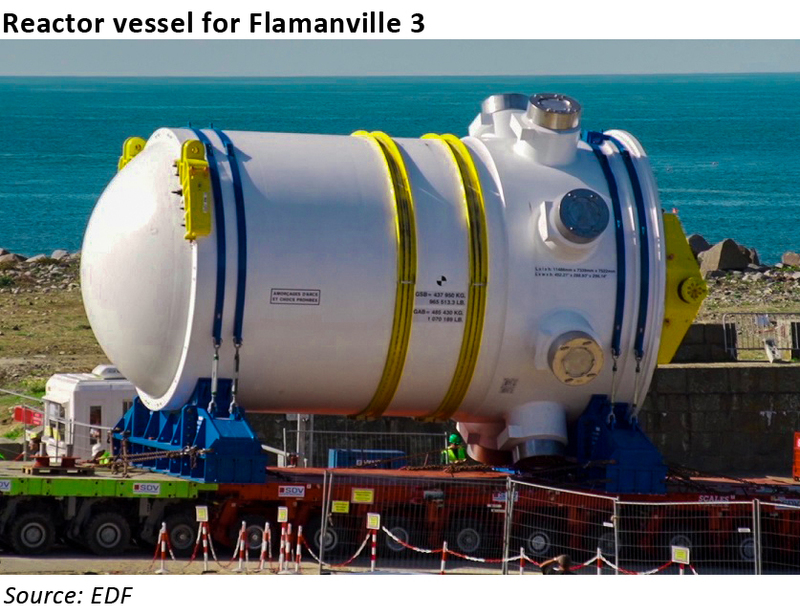 France’s Liberation newspaper explains that replacement of the vessel lids is not unprecedented, and has been previously done on around fifty of EDFs other French reactors. Such a replacement would take about 5-6 months to complete at a cost of €100 million, although it reports that EDF is hoping to avoid this by implementing new control protocols. Liberation goes on to provide some analysis of ASN’s decision. It suggests that as full replacement of the pressure vessel would cost over €1 billion (and possibly much more given the need to cut into the concrete containment around the reactor), and would further delay the commissioning of the plant. As EDF is 84% owned by the French state, and the costs of full replacement and the consequent delays in bringing the reactor into service, would increase the financial stress on EDF – described as “quasi-bankruptcy” – ASN may have been influenced by the potential financial implications for the state. The paper also suggests that ASN would have been mindful of the tensions with the UK, Finland and China where other EPRs are under construction were Flamanville to be further delayed. Reuters further reports on the position of Greenpeace which is that the ASN is not in fact independent. The decision on the Flamanville reactor was made following a recommendation by a committee of independent experts, however there are questions over how independent the experts actually are as they are reported to have close links with the nuclear industry. Reuters says it has seen a spreadsheet detailing the professional backgrounds of the 31 committee members, showing that eight of them work or have worked with the ASN or IRSN, the technical arm of the regulator, and another eight have worked for ADF or Areva, with only three being independent of the nuclear industry. – Mycle Schneider, author of the annual World Nuclear Industry Status Report. The British press has reported on an article in Le Monde that an internal review of the HPC led by EDF’s group audit director, Jean-Michel Quilichini due to be published in the summer has shown that the project is likely to be delivered two years late and at an additional cost of between €1 and 3 billion. The government wants nuclear power to form part of a low-carbon generating mix, despite the economics of nuclear power deteriorating in recent years. The Department aligned its approach to the HPC deal with its support for other low-carbon technologies. The Department did not assess the potential value-for-money implications for bill-payers of using alternative financing models. The government opted to negotiate bilaterally with EDF, rather than wait for competition between nuclear developers. The Department put in place mechanisms to mitigate the risk that negotiating a deal bilaterally would not minimise the cost to consumers. When the Department finalised the deal in 2016, its value-for-money tests showed the economic case for HPC was marginal and subject to significant uncertainty. The Department has not sufficiently considered the costs and risks of its deal for consumers. The Department’s overall case for HPC has weakened since it agreed key commercial terms on the deal in 2013. The Department’s capacity to take alternative approaches to the deal was limited after it agreed terms with EDF in 2013. Other parts of government reviewed the deal but did not sufficiently consider its costs and risks for consumers. The government has increasingly emphasised HPC’s unquantified strategic benefits, but it has little control over these and no plan yet in place to realise them. The reactor design for HPC is unproven and other projects that incorporate it are experiencing difficulties. EDF’s financial position has weakened since 2013. These factors mean there is a risk that NNBG will seek further financial support from the government, notwithstanding the contractual terms of the deal. The Department plans to develop and maintain alternative ways of ensuring energy security to mitigate the risk of needing to provide additional support for HPC. The government’s oversight arrangements of HPC’s construction will also be vital. The Department will only maximise consumers’ value if it maintains effective oversight of the contractual arrangements over several decades. The Department has aimed to protect taxpayers from exposure to the waste and decommissioning liabilities of HPC, but it is impossible to protect them entirely. “It is a widely shared view that the UK needs some new nuclear power to ensure the lowest-cost route to de-carbonisation. But the Department’s deal for HPC has locked consumers into a risky and expensive project with uncertain strategic and economic benefits. While committing the developer to bearing the construction risks means taxpayers and consumers are protected from costs overrunning, consumers could end up paying more for HPC’s electricity than if the government had shared these risks. Past experience shows that ultimately these risks could shift back to taxpayers or consumers. If the project runs into trouble, the government may need to fund alternatives to ensure secure supply, or come under pressure to renegotiate its deal. The Department did not sufficiently appraise alternative ways to structure the deal. According to the NAO, the government’s decisions were driven by a desire to create a backstop in case renewable energy projects were not sufficient to meet decarbonisation targets. BEIS analysis shows that deferring construction of new nuclear power stations would increase the total costs of the electricity system in scenarios where renewables fill the gap, but not in scenarios where gas generation fills the gap….a three-year delay in HPC where it is replaced by low-carbon alternatives could increase overall costs by 2.9% (£19.4 billion) whereas filling the gap with gas-fired power would result in a 0.1% (£0.8 billion) saving overall. A 10-year delay to new nuclear, with the resulting generating gap filled by a combination of offshore wind and CCS, would increase cumulative power system costs by 7.9%, (£52.3 billion). BEIS/DECC has modelled these scenarios on three occasions since it agreed key commercial terms for HPC, with some results showing lower societal costs if nuclear deployment is delayed, however some of these options required levels of new onshore wind that would be politically unacceptable. The September 2016 analysis, which takes fuller account of the wider system impacts of renewables, showed that the onshore wind and solar PV scenario would be more expensive than proceeding with HPC and follow-on new nuclear. However, a scenario with gas power stations filling the power gap created by a three-year delay to HPC and follow-on new nuclear would be lowest cost but this option was discounted on the grounds that gas generation would compromise the achievement of the 2050 de-carbonisation target. The NAO also considers that as the assessment of the impact on bills does not extend beyond 2030, consumers are locked in to paying a fixed price for power from HPC even if other technologies subsequently become better value – for example, offshore wind costs are projected to be lower than the HPC CfD strike price less than halfway through its 35-year term. Changes in market prices since 2013 mean that the expected value of top-up payments to EDF under the CfD has ballooned from £6 billion to £30 billion. In its December 2016 forecasts, the expected price of electricity was 32% lower than the price used in its 2012 projections, primarily due to falling gas prices. The CfD top-up payments will be recovered from consumers through their electricity bills. The NAO’s report is clear that the HPC deal is not a good one for consumers, and that it has been driven by a desire to secure progress against the government’s de-carbonisation targets. Given that there are still no EPRs operational anywhere in the world, and even at the time the HPC decisions were made, other EPR projects were suffering from major delays and cost over-runs, the entire project can be seen as a gamble at the consumer’s expense. Nuclear power is a sensible technology to deploy in a low-carbon energy system, but the choice of EPR over alternative approaches is baffling. Since 2011, two years before the initial HPC approvals were granted, Advanced Boiling Water Reactors were operating successfully in Japan. The NAO report suggests that HPC was pursued as it was further developed than other proposed nuclear projects for the UK, but as we can see from the difficulties faced by EPR projects, that situation can be reversed. The reality is probably worse. Successive governments have been intimidated by the green lobby to the extent that rather than promoting incrementally cleaner generation through coal to gas switching which would have immediate social benefits though improved air quality, they have pursued extremely expensive “zero-carbon” solutions which not only have high capital costs in themselves, but also in the case of renewables, have high system costs in terms of network reinforcement and managing intermittency. The tragedy is that despite these high costs, and the risks to system reliability resulting from the de-carbonisation agenda, this “zero-carbon” generation is far from being genuinely carbon free…the vast quantities of concrete and steel in their construction being a major cause of pollution, as well as emissions from back-up generation where needed. Add to this the shakiness of the science which underpins the hypothesis that CO2 emissions from human activity are causing harmful climate change, and the picture becomes even less attractive. The UK needs a new energy policy with new objectives. Security of supply should be the most important consideration, followed closely by affordability. De-carbonisation should be replaced with a broader definition of environmental responsibility, which takes account of the whole value chain involved in any technology, and energy efficiency should be given greater priority as removing waste and inefficient use of resources is generally speaking a lower cost approach than the delivery of new capacity. There is a clear role for nuclear power in the future energy mix, but there is no need for the kinds of risks being taken with the Hinkley Point C project. By all means, subsidise new nuclear power, but let’s choose proven technologies with a lower risk profile and a more predictable path to delivery. Nuclear power built to adequate safety standards has the potential to remove every single stitch of clothing from the renewable emperor and massively impact the gas market as well as utterly destroying the coal market. The only way to combat its immediate adoption as the de facto standard is by massive deployment of FUD – fear, uncertainty and doubt – using puppet organisations like Greenpeace, to somehow impose draconian safety legislation, delay projects by insisting on multiple safety studies and when the actual planning stage is complete, delay and frustrate construction by use of local action groups, spurious safety concerns and the like. By means of these techniques the cost and time to deploy a nuclear power station are effectively tripled. Despite still being far far cheaper than renewable energy overall. Installed ‘renewable energy’ of the intermittent kind – wind and solar – represents a multi-billion income stream derived from consumers and industry by force of legislation that runs at twice the cost of existing fossil and nuclear power and around 50% more than Hinckley point. Yet we do not find the National Audit Office offering any criticism, do we? It is clear that in fact the façade of impartial NGOS doing a brave and honest job bringing unpleasant facts to the public’s attention masks a politically and commercially motivated campaign that is covert, vicious and highly effective in spreading propaganda. Yes Hinckley is bad value, but it’s bad value because layer upon layer of regulatory ratcheting and continuously funded opposition by hypocritical green groups have made it so. But how much worse a deal is the already installed base of 20GW of solar and wind power which is capable of generating the square root of sweet Fanny Adams on a windless, hard-frosty -10C night in mid winter, when electricity is most needed? Big Money funds Big Lies. No organisation can not be bought, especially if consciences can be salved with faux ‘concern for the environment’. The first problem is that politicians have been convinced that “the science is settled” on climate change. They read the IPCC summary and not the report itself which admits that the data do not confirm the predictions of their models, and instead of changing their models, they develop a range of excuses to continue using them. This has led to a hugely expensive programme of renewable energy deployment. The second problem is that there seems to be a disconnect between what is safe in engineering terms and what is written in the standards. The cover-up of forging errors is a scandal (and great ammunition for NGOs), but given that there have been no nuclear accidents as a result, and testing shows the affected components are safe to continue to operate, one has to question whether the safety standards are being configured appropriately. My feeling is that since Chernobyl and Fukushima, there has been a trend towards over-specifying safety standards in a way which becomes difficult/expensive to realise in practice. The fact that no real 3rd generation reactors have yet been opened (ABWRs are arguably not really 3rd generation) is probably at least in part due to this. So it’s not just the price ratcheting from renewable subsidies that’s the problem, it’s also the cost inflation from trying to meet a tougher set of safety standards while also trying to innovate. The choice of EPR as the technology for new nuclear in the UK was a huge gamble, and the justification for it was extremely weak. In politics (as opposed to engineering) Truth is irrelevant, the only thing that matters is what people (can be made to) believe. Indeed the philosophical underpinnings of the New Left which has now become the establishment are based on the proposition that truth itself is a cultural concept, and truth is therefore relative to culture, which can be changed by the application of mass propaganda. This is of course nothing new, and religion has fully made use of this to generate politics and societal norms based on literally nothing: However these myths at least served to perpetuate themselves. The problem with myths that are actually running counter to science, is that they threaten to destroy the societies that adhere to them. Societies that’ believe in climate change and renewable energy’ will simply not survive, except by dint of massive doublethink, as in building Lignite power stations whilst ‘supporting energiewende’. That is my response to your first point. And it bleeds over into your second point. Over regulation beyond what is necessary. This is simply the result of the same ‘magic thinking’ described above. What counts is not how safe the reactors are, but how safe people can be made to believe they are, politically. Politics always had two parts – the actual business of governance carried on by civil servants in dark corridors in Whitehall, and the virtue signalling bun fight of parliamentary oppositions, where the hearts and the minds of the people were bent to support one faction or another. What seems to have happened post Blair, is that the bun fight has been carried through to the actual business of governance. Decisions are no longer made by people with a dedication to the survival of the nation, but are made purely too support the bun fights. Nuclear power is politically toxic. That it makes complete sense is not sadly the point, the point is that it may make a government that espouses it unelectable. Finally, all this may simply be a symptom of impending societal collapse as Joseph Tainter elucidated in his book ‘The collapse of complex societies’. When society has become too complex to understand, not only for the electorate, but even for those elected to direct it, its future is entirely a matter of luck. Which will eventually run out. The existential problem that civilisation faces is exactly personified by climate change. The threat is not climate change itself, it is the fact that so many people can be persuaded of its actuality, against common sense and evidence, and that the people who advocate it as a justification for political policy, both seem to believe in the ability of human management systems to control society down to the last detail, as well as the inherent correctness of trying to. IN this they are supported by second and third rate minds,. who, schooled in the solution of linear differential equations, now assume that the world is comprised of and run according to the mathematics of equations they know how to solve: This insane assumption, that because the universe appears to be deterministic it is therefore ipso facto predictable and controllable, has been blown out of the water by the science and mathematics of the 20th century – quantum theory, chaos theory, Gödel’s incompleteness theorem, Turing’s halting problem…. and the like – and yet people still operate with the mindset of the Victorian optimist, that nearly all things had been discovered and we were only a step away for understanding everything. Dynamic system theory – the techniques used to build and assess things like nuclear power stations, and run them safely, tells us that the sort of political structures envisaged by the naive optimists who espouse ever larger political blocs up to world government, cannot ever be stable. It tells us that no economy can be controlled in the way we attempt to do it, and that a boom and crash free market is probably as good as it gets, despite being so far from ideal as to be frightening. All in all the situation can be summarised as the erroneous proposition that the solution to bad politics is more politics. The small libertarian voice that suggests that the solution to bad politics might in fact be less politics, is never heard these days. Largely one supposes because politicians by and large benefit hugely from more politics. Finally I apologise for steering the conversation from the specific issue of nuclear power to a far more general critique of 21st century politics philosophy and science., but I think that the suggestion that the root of the problem that we find in the political absurdities of nuclear power, is in fact quite far removed from the actual issues of nuclear power. It’s that old. Who can ensure that out politically appointed masters have the competence and the social humility to act intelligently and in our best interests? Up till the collapse of the soviet union, the existential threat of being replaced as entire political class by a technologically sophisticated enemy, at least forced the ruling elites to manifest some kind of competence. With the demise of the cold war not even that reason is left. Why would a highly paid Eurocrat care what happens to Europe, so long as his pensions and position and personal situation as part of the ruling elite is assured? Anyone would be forgiven for opening their eyes one morning and coming to the conclusion that we are in fact embroiled in a savage and ruthless war, already, in which no element of society is sacrosanct, and any institution, system of thought, philosophy, or peoples’ lives themselves can and will be sacrificed on the altar of political expediency which has only one motivation, the survival of a ruling class that is so far beyond the ability to rule with any competence whatsoever, that it itself constitutes the very existential threat to civilisation that it claims is posed by such things as ‘climate change’. Nuclear power is simply one of the casualties. Nuclear power smacks of old fashioned competence, an artefact of a time when people considered that ensuring the good of the people was in their duty. Noblesse obligé indeed! How quaint and old fashioned is that!